All PTA Presidents in the district are invited to celebrate the collaboration of PTA Presidents and their respective school Principals. Council provides a delicious lunch while Presidents get to know their Principals better in a social environment. Plus, there’s the added benefit of networking with other PTA Presidents and Northshore School District administrators. Presidents, if you are unable to attend, please send someone from your executive committee so your Principal will not have to eat alone. Invitations will be sent to PTA Presidents at their respective schools the week of October 8th. 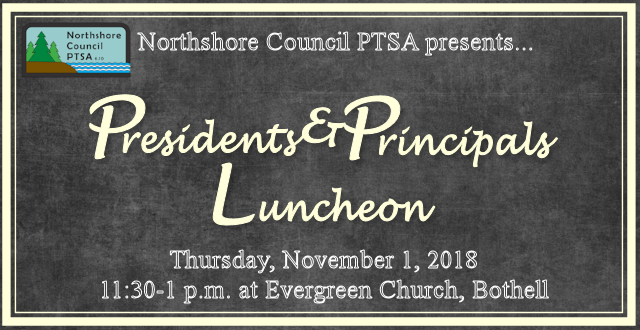 To RSVP or if you have any questions, please contact Carrie McKenzie at president@northshorecouncilptsa.org.